Oliver Bierhoff says Germany will find it harder to beat Argentina in the World Cup quarter-final than they did to overcome England in the last 16. Before the tournament began, England were rated more likely than Argentina to lift the coveted trophy. 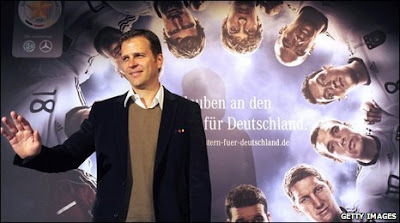 But Germany general manager Bierhoff said: "It is not going to be easy on Saturday because Argentina are a stronger side than England. "There were some obvious English weaknesses that had all been there in the group stages. "Argentina are much more powerful and stronger. They have very few weaknesses - although there must be some." Huh Jung-moo has resigned as coach of South Korea following their 2-1 defeat by Uruguay in the last 16 at the World Cup. Under Huh Jung-moo the team advanced out of the group stage for the first time on foreign soil but the coach was eager to "recharge". "There are many great and capable ... leaders in our football community. I think they should be given a chance to coach the national team," said Huh Jung-moo. "What I felt during the World Cup tournament is that the global football powerhouses, especially the South American teams, performed well and were too much for us." Former Argentina coaches Marcelo Bielsa and Jose Pekerman head Japan's wish-list to take over from Takeshi Okada, according to the Japanese press. Okada is set to retire to a life of writing poetry and farming after the Blue Samurai were knocked out of the World Cup in the last 16. "I want to get away from soccer," Okada told Japanese television following their penalty shootout loss to Paraguay. "Even if I was offered a new contract. It won't happen so let's not talk about it." Meanwhile, Japan defender Yuichi Komano is set to get a medal, even though his missed penalty against Paraguay led to the country's World Cup exit in the last 16. The governor of Komano's native Wakayama prefecture, Yoshinobu Nisaka, told Japanese media he wanted to give Komano a medal for his efforts in South Africa. "We would like to present Komano with a medal for giving people such dreams and emotions," said Nisaka. New Zealand coach Ricki Herbert was guarded about his future when he arrived home on Friday after steering his team to an unbeaten World Cup campaign. Although New Zealand failed to progress beyond the first round of the tournament, the team surpassed expectations. Herbert is reported to have received approaches from clubs in Europe, Asia and the Middle East but would only say there were "a few things" in the air. He said he was immediately returning to his job as coach of New Zealand's only professional team, the Wellington Phoenix, and expected to have talks about his future career with Football New Zealand.